Conference phones solve the problem of group communications in the office. They provide professional audio for conference calls: 360° audio pickup, a clear loudspeaker, and centralized controls. VoIP conference phones are network-connected solutions that integrate with your VoIP phone systems or cloud VoIP service. IP conference phones can feature HD audio with echo cancellation and audio enhancements like background noise reduction. Use your conference phone as a central microphone for video conferencing. Find USB speakerphones for mobile, plug-and-play solutions for conference calls. 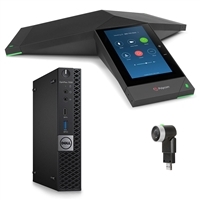 We sell Microsoft certified conference phones for Microsoft Teams and Skype for Business. If you need to extend the audio pickup coverage, look to conference phone expansion microphones. What Should I Look For in a Conference Phone? A conference phone is a staple in any modern meeting space. Huddle rooms, boardrooms and executive offices require technology more than ever. A meeting of the minds isn’t complete without a conference phone in the middle. The microphones and loudspeakers built into conference phones are designed to cover the entire room. As opposed to the speakerphones on desktop phones or mobile devices, which only blanket the space directly in front of them. Not every one of these considerations is required or helpful in every environment. For example, a wireless conference phone isn’t necessary if you don’t need to transport the unit or worry about hiding cabling. A scalable unit also wouldn’t need expansion microphones in tiny meeting spaces with just a few participants. Sometimes, these considerations are important for planning for the future of your office. While a wireless or scalable model isn’t needed now, what about as your business grows? Will you require those specifics then? It’s not as simple as plopping a conference phone in the middle of the table. Sure, the installation might be easy, but the technology part of it isn’t what we’re talking about here. When you’re setting up a conference phone, make sure that the room is prepared. Meaning, try to reduce potential problems caused by background noises, voices bouncing off the walls to create echoes and other acoustics in the room. Don’t turn the meeting room into a soundproof box like a recording studio, but a little shielding in the room does go a long way towards a successful conference call. Expansion microphones are popular items for scaling a conference phone. The average conference phone has one or a few microphones built into it. When the conference phone is set at the middle of the table, it can’t reach participants at the far end of an oblong or rectangular table, or reliably pickup the voices of everyone in a large group. Adding more microphones to the conference phone ensures that everyone’s voice is heard. No more having to lean over the table or shout at the phone. Several models support giving participants their own individual microphone. A select few conference phones, like some ClearOne devices, support daisy chaining. The phones can be linked together and operate as one cohesive unit. Two ClearOne conference phones spread out on the table, for example, can double the clarity of any conversation. Imagine a group of children sitting at a wide table with a bucket of candy in the middle. They’ll try so hard to reach that sugary goodness, but will come maddeningly short. The pickup range of a microphone is determined by how far a person can be from the conference phone with it still being able to hear his or her voice. Matching the microphone pickup range with the table and meeting room size is important. Otherwise, the conference phone’s microphone has to reach, which can make anyone’s voice sound hushed or distorted. Bad sound quality results in listener fatigue. Remote participants in the call will have to strain to hear you and overall productivity will fall. The same is true for headsets and other telephony equipment. The battle of wired versus wireless solutions will rage on forever. Neither connection type is right for every situation. Wireless conference phones are available in DECT and Bluetooth. The DECT conference phones require a DECT base, while the Bluetooth conference phones are more standalone models. Both versions must be recharged through a charging base or AC adapter when the battery drains. The world is more connected than ever thanks to technology like mobile devices and video conferencing equipment. Smartphones and tablets let workers take their offices on the road, and video conferencing systems are providing unique tools for collaboration and face-to-face communication. Combining a conference phone with your mobile device or video conferencing setup is a great way to increase productivity. 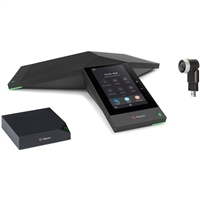 Polycom IP SoundStation conference phones are perfect for Polycom video conferencing solutions. Many of the phones and systems are designed to work together as an innovative way of expanding your communications equipment. Take a conference call on your cell phone for more private conversations. A simple headset jack will suffice, in most cases, for connecting a smartphone or tablet to the conference phone. A compatible conference phone can also be used as a loudspeaker or speakerphone for the mobile device. Conference phones are available with different connection types. These connection types include analog, IP, USB and Bluetooth. Different forms are available too, including desktop models and wireless models. As discussed in the previous section, wireless models use either DECT or Bluetooth signaling and require some kind of base or charger. Connect an analog conference phone to your legacy phone system or PSTN. By using an ATA or VoIP adapter, the phone can be interfaced with your VoIP network or IP PBX. When properly provisioned, businesses can use an analog conference phone with either a legacy or VoIP connection, ensuring the phone will have a link to telephony services. Operate these conference phones with your VoIP phone system. Voice over IP offers a better range of features than analog telephony. Like VoIP phones, IP conference phones can support features like higher quality audio, SIP and PoE. 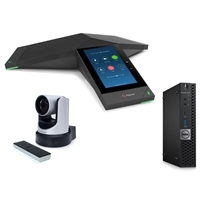 Additional benefits of IP-based conferencing devices range from better on-screen menus and PC-based management, to interoperability with video conferencing equipment and other systems. Computers can utilize VoIP as well as any phone. Through softphone applications and IP PBX software, a PC can make calls, act as a switchboard or deliver other services. USB conference phones can be plugged into the USB port on a computer or PC. The conference phone can act as a speakerphone or conference phone, depending on the features available to the device and the computer. Many professionals use cell phones as a primary phone. Bluetooth enables cell phones and conference phones to wirelessly connect. The Bluetooth conference phone can act as a speakerphone for a cell phone, smartphone, tablet or other mobile device with embedded Bluetooth. USB dongles can also connect a computer or PC to the conference phone. Wireless conference phones with DECT technology are popular for reasons such as reducing cabling and moving the phone from room to room. DECT conference phones require a base station, which sends wireless DECT signals to the phone. The base station is connected to the phone system through an analog or IP interface. DECT technology is highly regarded for its security and wireless range. Analog and IP conference phones are usually larger than USB and Bluetooth conference phones. Analog and IP conference are better suited for formal meeting rooms, designed to rest in the middle of a table and reach around the entire space. USB and Bluetooth conference phones are typically for one or two participants and have a portable form factor. These phones are for more personal use, including as a speakerphone or, in some models, to play music too. Shop for a new conference phone at IP Phone Warehouse. We make the shopping experience easy. If you need help, contact our customer service through email, phone or Live Chat. Technical support is also available, including provisioning and troubleshooting. The industry’s number one brands are at IP Phone Warehouse, including Aastra, Cisco, ClearOne, Konftel, Lifesize, Plantronics, Polycom, Revolabs and Snom. We are a certified and authorized reseller.